As a youth growing up in Cudahy, Calif., Josue Barron did not have a clear path to many opportunities. At 13, he joined a gang. After a few years of living a dangerous lifestyle in the streets of Los Angeles, Josue knew it was time for a change. After graduating high school in 2007, he broke free from the hierarchy of the streets, deciding instead to live by a different code of brotherly love and security – that of the U.S. Marine Corps. After Infantry training, he joined the 3rd Battalion, 5th Marines (3/5) in Camp Pendleton. Between training and deployments, he met the love of his life, Debbie Salazar. The two married in February 2010, seven months before Josue deployed to Afghanistan. On Oct. 21, 2010, Cpl Barron was conducting military operations in Sangin, Helmand Province, Afghanistan, when he was injured by an improvised explosive device (IED) explosion. The blast resulted in the loss of his left leg above the knee as well as his left eye, and caused multiple severe shrapnel wounds to his face and hands. After years of intense rehab at the National Naval Medical Center in San Diego, he now wears a prosthetic leg and glass eye, and stands proud of the strides he has made and the example he has set for others. 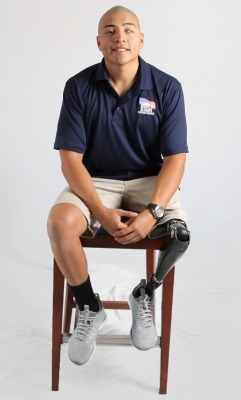 Despite his injuries, Josue has participated in six full marathons including two Marine Corps Marathons; he also participated in the third annual Warrior Games as a hand cyclist and wheelchair basketball player. He also golfs, surfs, skis, and rock climbs, and is an active volunteer for a number of Veteran organizations. After having their two children, Leon and Troy, Josue and Debbie developed an interest in family entertainment. They started their own business called American Dinosaur Events, which provides lifelike walking dinosaur costumes for birthday parties, classrooms, and corporate events. Due to Josue’s busy and active lifestyle, he prefers to use his wheelchair most of the time while at home. This causes challenges in his current living situation and requires Debbie to handle much of the childcare and household chores. The situation has become even more difficult after the birth of their third child, James, in 2018. “My wife is the only that can carry our children up and down from their rooms upstairs,” he says. Receiving a specially adapted Homes For Our Troops home will alleviate the daily burden of navigating a traditional home. Additionally, the mortgage-free aspect will give Josue the freedom to pursue his goal of becoming a successful entrepreneur and a mentor for other Veterans. He earned his bachelor’s degree in business from the University of Phoenix in spring 2017. For the past five years, Josue has worked for a company providing realistic training and stunts for law enforcement and military leading him to be cast as a stuntman in the movie Peppermint, which is debuting in theaters September 2018.